Staring at the crossbow and radio in the Bathysphere with her, Elizabeth knew she had a decision to make… Whatever happened at the docks, violence was bound to involved with Sullivan and Booker on one side, Fontaine’s men on the other. She stood sharply, leaving the crossbow behind and stepping out to dank air and gunfire with just the radio. She’d have no part in killing the wrong man. Crouched for cover, Elizabeth followed the sounds of screams and bullets, weaving through the wreckage their fighting left. At last, she reached a door to the main area of the docks where she presumed Jack was first rescued… Where Booker stayed behind. She tightened her grip on the radio, approaching the door decorated with bronzed rays reaching out towards the frame. Only to see it half open, the firefight going on just beyond reach. If they killed the man they believed to be Fontaine before she got there, they’d not only kill an innocent man, but give Fontaine freedom to search for Jack. “Stay–” A blast of fire roared by here and she ducked, taking a sharp breath in and feeling her heart thrum in her chest. “Stay there, Elizabeth! Don’t move!” He finished, still out of sight. 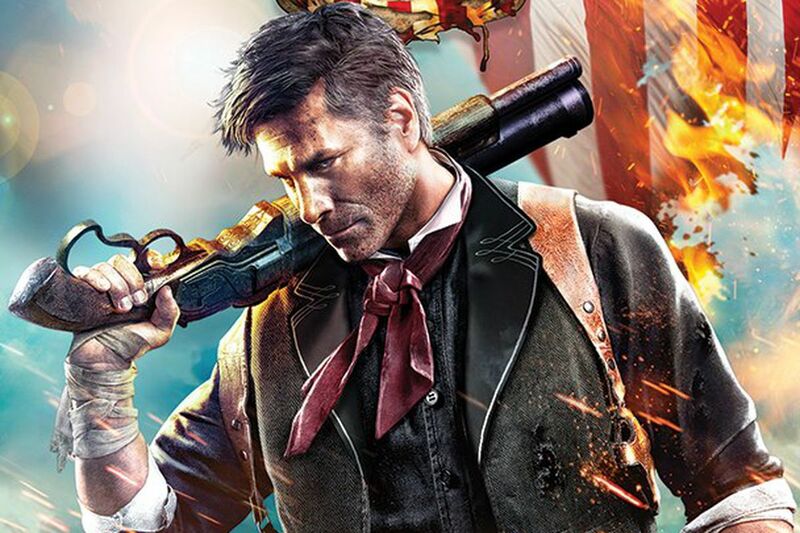 “Booker, get back here! This instant!” She huffed, but he was gone. Clipping the radio to her skirt, she propped her hands on her hips and examined the door. It was wedged open by some mechanical error, the gap slightly wider than her shoulders. “I can fit,” she decided and reassured herself. Elizabeth tucked a curl of hair behind her ear again, reminding herself to get a clip for that soon, and smoothed her blouse. “Nothing to be nervous about.” …but should she do this? Maybe it was possible to stop them from killing Fontaine’s fake if she could only get a hold of someone with the authority to stop them. “Ryan,” she whispered to herself. Ariel! This wig called to me. Coco Adel (RWBY) is all about holiday fashion. Not so much about this crooked tree. Nora Valkyrie (RWBY) has a boop for all seasons. As part of a community challenge on the BioShock Amino, I put together a closet cosplay for Jasmine Jolene from the first game. Controversial her character may be, but this was a delight to do and I hope to do more challenges like this in the future! Who says loyal can’t be stylish? The familiar ridges and bumps of the metal stump of her finger comforted her to an extent… Booker climbed the stairs with the theater lights on his shoulders, reflecting off his gun. Her first steps after him were more sure than she felt, but Elizabeth followed and sat beside him in the Bathysphere to the docks. “You sure the little miss should be coming?” Sullivan looked to Booker as if she wasn’t even there as they rushed through the ocean, bubbles whirling past them. “You’re welcome to try stopping her. I’m not about to,” Booker replied flatly, eyeing the radio that had been returned to its place in the Bathysphere. It reminded silent but perhaps that’s what worried him… But she couldn’t resist a soft chuckle after their exchange. “I can defend myself, Mr. Sullivan.” True, she spent most of her time with Booker outside the tower just hiding during fights, but once the rebellion began… Daisy and Slate insisted she learned to fight as well. Crossing her legs, Elizabeth flashed a knowing smile at Sullivan and he grimaced in response. “Should’ve known… All the dames here are razor sharp, one way or another.” He shifted in his seat, his casual suit (if one could call it that) straining against his movement even with the first button of his shirt undone. Though Sullivan was not much to look at, he was a man built like a brick. 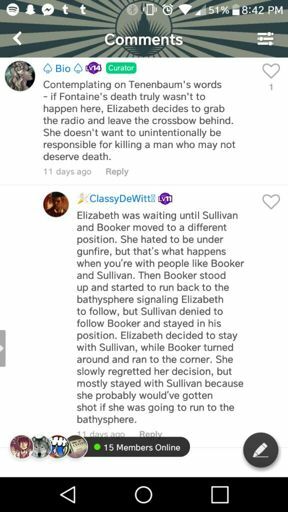 Booker was athletic, but Sullivan… He looked like the sort of man who wouldn’t flinch if you punched him directly in the jaw. 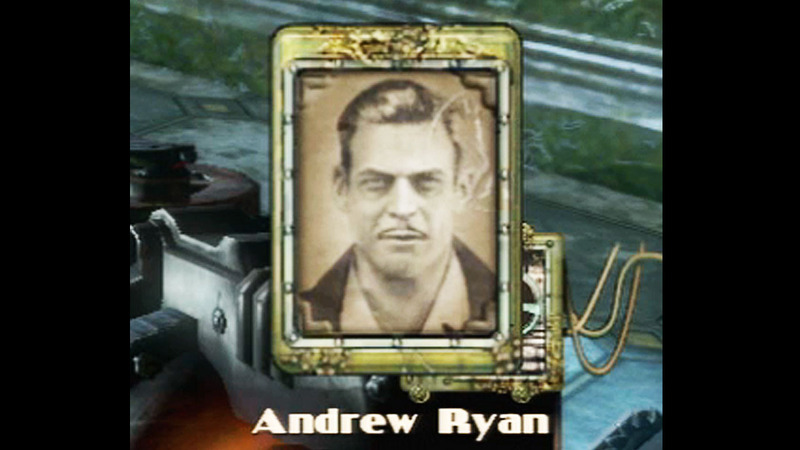 She could see how he became the head of Rapture’s security and so close to Ryan. Booker and Sullivan moved out down the dark hall toward the ports, hunched for cover. Other men were already waiting for them at the turn of the hall, welcoming the two of them as new cogs in their war machine. 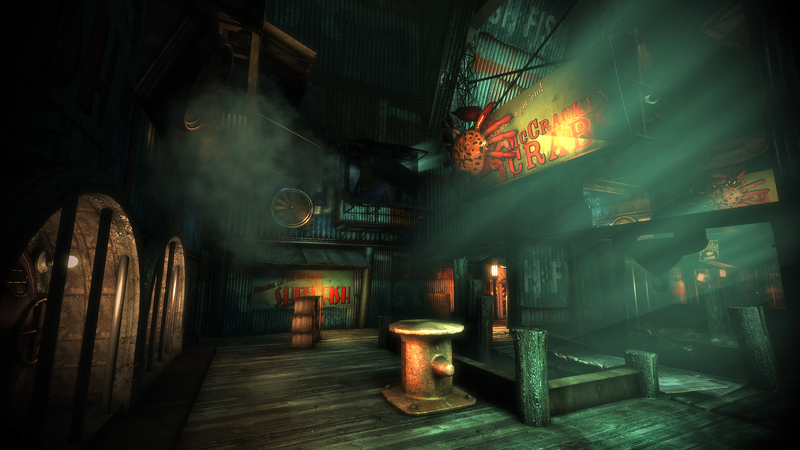 One such man turned his gun to the rafters and a woman with… Were those hook in her hands…? She fell from the ceiling with a few bursts from the barrel of the soldier’s weapon. The real Fontaine wasn’t here. This death was fake and with it, he’d be free to maneuver the city and find Jack again. This was ahead of schedule but he’d also just lost a critical piece of his plan. Beside Elizabeth was the crossbow from when she first came to get Booker… Or the radio still resting against the wall where she’d first found it. The carriage ricketed down the path, rocking from side to side not too unlike the boat Oliver left behind a few days ago. Honestly, he should’ve puked up his entire stomach by then. If not from the motion, from the anxiety, if not from those, from the excessive spellcasting and all-nighters, and if not from all of that, from the fact that everyone he met was tired of him already. “Excuse me, yes, pardon me,” he began, possibly out of desperation for some social aspect to break up the blur of practice and half-sleep, “Hypothetical question for you,” he said through the small window to the carriage driver. Rick was his name, just a dull-eyed teen who didn’t turn or acknowledge him in any fashion. “If you were heading toward a massive contest, or at least formerly massive, that would earn you possible worldwide renown and a great portion of your material desires for the rest of your life, even if it would put that life in certain danger of an abrupt and humiliating end– Would you still go?” He waited. A jerk of the reins brought the horses on a steady turn and the driver scratched at his stubble. And they didn’t speak again until the sun eased its way down and the moon slid its way up. Rick originally turned the horse onto a path to the miserable village of Kendon. That was before Oliver got him to swear to turn the carriage around, drive through the night no matter the threat, and travel to Aethia, the (waning) magical capital of the world. Rick made some money off the vow. Still, they made it to the arena at the city’s approximate center before noon and that was all that mattered. Even if that was when the driver got the other half of his payment, Oliver was thrilled to finally arrive, to look at the vaulted stone spires and rows of pointed arch windows. Oh, to take it all in firsthand… As Rick unloaded the mage’s two carpet bags onto the limestone path and eventually stared at the stout steamer trunk on the rear luggage rack. Oliver was so fixed on the arena, imagining his way through corridors to his assigned and truly unremarkable room (though it would impress him to no end), that it took the carriage boy speaking to get his attention. With a whispered incantation, his eyes closed, he missed Rick’s muted expression of shock and revulsion as the trunk rocked. Sticks of cedar jutted out from its side, the wood cracking in the strain even as the process left no marks in the trunk or the leather straps. Oliver kept his eyes closed, muttering the made-up language while the sticks bent as if they had an elbow, coming out further until they ended in square hands. They had no form, looking like thumbless mittens even as they closed and opened. It got up on its rangy haunches, shook the new arms and legs as if their stiffness could be fixed that way, and clambered down the side of the carriage to pick up the waiting bags. “Sure,” he said, seeming a little concerned about something. It had to be one of their mental states. But he put the sack in his pocket and returned to the carriage led by the chestnut horse with stunted ears and eerily large eyes. Riding inside the whole time, the mage didn’t notice until now just how unsettling they were. The two turned their separate ways and that brought Oliver to the arena’s gate, guarded by security officials in navy blue uniforms with glinting silver trims almost outshone by the spotless black of their shoes and for some, the badges on their uniforms. Naturally, only two of the ten officials would talk to him. “Your aide. Where are they?” Aide. Aide. Why hadn’t he heard of this before? Oh no, not good… They were starting to question his hesitation. He didn’t even ask if he could join without an aide since he already had the Trialist Charm and all. He just left the trunk behind to wait, running past the landscaped woods towards central Aethia. If he could find Rick at the stables, if any remained, offer him yet more money, which he was running out of, and convince him to be his aide, learn some magic… Well, that shouldn’t be hard. Wasn’t that everyone’s dream? He got a leery look, a once-over to see if maybe he looked the sort who would kill someone in their rented room and cause a huge mess for the owner. Another few coins lost, but the room’s location gained, he went upstairs to the third door on the left and banged an open hand on the door. Oliver jumped at the thump inside the room, maybe something slamming against the wall or onto the floor. He waited, biting his lip and biding his time. “Rick,” he ventured after a few seconds without another sound. “How is everything in there? Are you alright?” Soft rhythmic creaks got louder and then the door opened just a crack. Rick looked worse now than before, a lot worse. “What is it.” Eyes half shut and the look on his face just begging Oliver to give him a reason to punch the mage, Rick wasn’t in any mood for politeness and Oliver wasn’t crazy enough to demand it. Well then. Alright, Oliver could work with that. Running both hands through his hair, taking a deep breath, he started up with his explanation. “Hey, hear me out,” he bargained, stopping the door with his hand only because Rick didn’t slam his hand in it. If he really wanted to, he could. Being a carriage driver made him a lot stronger. “There’s a lot in it for you, Rick, I promise. I’ll pay you twice what you made as a driver,” Oliver said, counting the benefits on one hand and watching the driver’s interest pique as his eyes almost nearly opened. “I thought magic was dying off,” he answered, but he was swaying, Oliver could just feel it. Or perhaps that was the numb, light feeling of lacking oxygen. And then there was the wait. He kind of hated looking at Rick leaning against the doorframe, thinking, wondering if this was worth it. When that smirk finally came, it brought a flood of relief with it and Oliver smiled back. Wasn’t often that both of them felt happy for the same reason. © 2017 Jam Blute, All Rights Reserved.